To understand the unprecedented outcome of the last Valparaiso municipal elections, it must be considered as the challenge that it represents to the Chilean political stability at the national and local levels. Indeed, since the end of the dictatorship in 1990, incumbency has oscillated between two political factions; the first is a large center-left coalition, primarily comprised of the «Democracia Cristiana» (Christian Democrats) and the «Partido Socialista» (Socialist party), that governed the country continuously from 1989 to 2010. The alliance expanded in 2013 to integrate the «Partido Communista» (Communist Party) within its ranks, and rebranded itself the «Nueva Mayoria» (New Majority). On the other hand, the opposition is an aggregate of the center-right and the highly conservative right-wing political parties. The latter are considered to be the default democratic heir of the Pinochet era that regained power in 2010 with the election of the business mogul Sebastian Pi-era. Politically, what characterizes this period of renewed Democracy is the tacit consensus from across the political spectrum to uphold the neoliberal economic model that was pursued during the dictatorship. Although not yet born at the advent of the military coup on September 11th, 1973, Jorge Sharp is not an unknown figure within Chilean political circles. He first entered the political scene during the famous student protests that shook the country for several months in 2011. During that time Sharp was at the head of a student federation in Valparaiso. He will rapidly try to translate politically what can now no longer be understood as an isolated cry against a dysfunctional educational system, but rather, as a concerted rejection, especially by the youth, of the political oligarchy in power since the end of the dictatorship. He then joined the Marxist-influenced party, «Izquierda Autonoma» (Autonomous Left), created in 2008. Within its ranks, Sharp met Gabriel Boric, who is now an influential political figure, and Chilean Representative in southern Chile. Quickly, however, Sharp distanced himself from the directives of Izquierda Autonoma, notably with regards to its electoral strategies and desire to join the incumbent coalition. 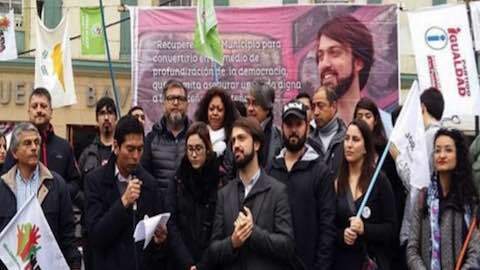 As a result, in January 2016, he will conjointly with Boric create the «Movimiento Autonomista» (Autonomous Movement), a new political party with the ambition of becoming a prominent player in Chilean politics. Firstly, to appoint a candidate who stems from local politics or from other endogenous social movements, who will ultimately challenge traditional political parties and the incumbent mayor Jorge Castro Mu-oz. Castro Mu-oz was a member of «l'Union de Los Democratas Independientes» (The Union of Independent Democrats), a conservative party, in power for the last two terms. Secondly, to initiate an inclusive participatory process to elaborate a comprehensive political agenda to be implemented by the designated candidate. Like Boric before him, under the Movimiento Autonomista banner, participated to the Matriz Urbana's primaries which he won by a thin margin. The election, open to all residents of Valparaiso, was marked by a weak turnout with little more than 5,000 voters, which represented only 3% of the total electorate. This unimpressive score prevented Sharp from having decisive backing and conferred little legitimacy at the start of the campaign trail. Nonetheless, with the support of the Matriz Urbana front, he succeeded in transforming a civic movement into a fully-fledged inclusive candidature and rallied militant and politicized groups around him. It is these same local social movements, ranging from environmentalists to feminist factions, but also including labor unions and other neighborhood co-ops, who carried and advocated Sharp's candidature to the local populace. This new political regrouping took on the name of «Movimiento Valparaiso Ciudadano» and placed a special emphasis on citizen movements as its driving force. The program proposed by Sharp was composed of several propositions, many of which were centered on sustainable urban development. Attention was focused on the 'higher' locations of Valparaiso, which tend to be underprivileged areas prone to recurrent wildfires (as was the case in 2014), and the objective was to equip these areas with functional public infrastructure (running water, sewers). The primacy of education was also at the core of this new program, with a commitment to strengthen public education and to establish a common pedagogic bedrock that was clearly stated. This educational program was structured to integrate the unique challenges and features of Valparaiso's socioeconomic and environmental landscape. Three months after being invested as the candidate of Movimiento Valparaiso Ciudadano, Jorge Sharp won the municipal primaries with 54% of the vote, a decisive victory over the incumbent Mayor and a candidate chosen by the governing center-left coalition, each with tallies of 22%. Although this margin was considerable for Sharp, the abstention rate was historically high, close to 69% (compared to the national average of 66%). This is an important element to take into consideration when evaluating this political upset. The upcoming elections and the "Frente Amplio"
The presidential elections are scheduled to be held this November, heralding the end of Bachelet's presidency after having completed her second term in office. In the last four years, several reforms have been enacted throughout different ministries. Reform in the educational sector was intended to abolish the profit-seeking mechanism prevalent in higher education; this pivotal proposal was part of Bachelet's central presidential campaign promise to abolish university tuition fees. Extensive reform of the Chilean fiscal system, one of the most straightjacketed in Latin America, was also a spearhead of Bachelet's campaign. Finally, with respect to human rights, the legalization of therapeutic abortions will undoubtedly go down as one of the defining victories of Bachelet's second term. These reforms stem from the desire to reduce growing inequalities resulting from a neoliberal economic model resting on a socially conservative substratum. However, it has to be said, the advent of the reforms proposed by the Bachelet administration is the result of the rejection of the model in place by various sectors of Chilean society; i.e., the tacit neoliberal pact introduced during the dictatorship which remained unchallenged by the subsequent democratic governments. The model's advocacy of the marketisation of society whilst accepting collateral inequalities was implicitly accepted by the successive coalitions in power as a necessary evil to achieve modernization and economic growth for Chile. From this perspective, we can understand the frequent mobilizations observed in the last decade which overreached mere sectorial demands; the 2011 student protests epitomized this tendency. Against this background, the reforms undertaken by the Nueva Mayoria only disappointed a majority of Chileans, in particular those on the left of the political spectrum. Indeed, none of these reforms, which were at the core of the Bachelet's second term proposals, provided a transformative alternative to the current model and instead, offered only superficial changes. The formation of the Frente Amplio (Broad Front) resulted from the combination of two deciding factors: the disillusionment of a large part of the Bachelet electorate, and the local successes of candidates of unaffiliated parties including Gabriel Boric, Giorgio Jackson (Deputies), and Jorge Sharp. They define themselves as "a broad political and social movement that aims to democratically change the unequal power structures in Chile. The Frente Amplio brings together some fifteen Chilean parties and political movements, most of them within a political prism ranging from the libertarian left to the ecologists, to parties that reject the left-right classification altogether. Also included is the Chilean Pirate Party, inspired by the Icelandic movement which advocates direct democracy and free access to information technology, and even the Chilean Liberal party. Indeed, a similar modus operandi was found in the election of a candidate for the Frente Amplio. The party organized a primary open to all citizens, regardless of whether they were members of a political party. The internal negotiations in the Frente Amplio led to a double candidacy in the primaries; namely, Beatriz Sanchez, journalist and essayist, and Alberto Mayol, sociologist of the University of Chile, both novices in politics. Finally, Sanchez, supported by Sharp and Boric, was elected on July 2, 2017 with more than 67% of the 330,000 votes cast during the primaries. The rapprochement between these two camps goes one step further -- both utilized inclusive participatory formulas to draft a citizen-centered political program. A great number of local debates and other meetings took place across the country, contributing to emerging proposals. These were then amended at the regional level before becoming fully integrated into the party's agenda first draft. The final ratification was to be voted via an electronic platform so as to prioritize pressing issues as well as to choose between several policy options. Around 20,000 people participated in this novel policy drafting process. In a country of about thirteen million potential voters, 17,000 people voted on Internet to ratify the party's manifesto, in a country where there are around thirteen million potential voters. We must, therefore, relativize this citizen 'revolution' and put this initiative into perspective. Chile has, since the return of democracy and the end of mandatory voting in 2012, experienced levels of disaffection for politics never seen before. As evidenced in the last presidential election (2013), participation did not exceed 50%, and was down to 42% in the second round. In any case, Sanchez' chances of becoming the next Chilean president are slim to none; indeed, the former president Sebastian Pi-era is far ahead according to recent polls. Nonetheless, the stated objective of Frente Amplio, i.e., to challenge bipartisanship whilst establishing a citizen's party within the Chilean political landscape, is slowly becoming a reality. Remarkably, Beatrice Sanchez, the newcomer, who started the campaign with only 3% of voting intention, is currently believed to have around 15% voting intention which, in effect, places her in third position behind the two front runners. When put into perspective, the Chilean experience is not a unique occurrence. Indeed, today's Western democracies are characterized by the simultaneous development of radical citizen movements at the local and national levels, born out of popular activism from which it exerts its legitimacy. The genesis of the Podemos party looms over the spawning of contemporary citizen movements. Itself the successor of the "Indignados", the party erupted on the Spanish political scene shortly after the onslaught of the financial crisis, spontaneously securing several seats in the national assembly. It is interesting to note that in Spain the pendulum of activity between local and national forces moved in the opposite direction to that of Chile. Podemos' inception was based on national and international issues, before ultimately redefining itself at the local level. The accession to power of both the Barcelona and Madrid incumbent mayors was supported by social movements and endorsed by Podemos, and they are now the flag-bearers of the party, which experienced setbacks during the last elections. The other similarity between Podemos and Frente Ciudadano is the presence of an iterative process that manages the conceptualization of the movement and its political ambitions, as well as the political practices that maintain and advance it. It is also revealing to learn that many of the young intellectual leaders of the Frente Amplio party have taken a close interest in the popular processes engendered by the crisis and its repercussions in Europe and the United States (Siriza, Podemos, the Occupy movement). This is perhaps what seduces the radical left and gives it a certain unifying momentum, having been able to arrive at a diagnosis of the early twenty-first century and the crises that shook it. An analysis which affirms the necessary integration of the populations into the design of the future political project, whether it be in Spain or in Chile. A discourse relayed by participatory practices that differ from traditional channels used by 'ordinary' parties. Although these movements stress citizens' integration as their central political motivation, this luminous concept cannot hide the fact that, it may represent the only common denominator of these groups and that of the individuals who form them. Within both Frente Amplio and Valparaiso, heterogeneous formations are grouped together with very different, even opposite, positions, especially concerning economic issues and social transformations. This raises real questions about the durability of such organizations and their resolve when confronted with the pangs of political management. The Chilean experience is a case study which sheds light on the articulation between local force and national expansion. Thus, the election of Jorge Sharp and the constitution of the Frente Amplio suggest that their materialization may not be a mere epiphenomenon; indeed, they both feed on global processes while anchoring themselves in a local and active reality. The question of what brings citizens together in these initiatives, under which banners and behind what projects of society and government, appears as the major challenge, at a time when other movements claiming themselves to be from the people, carry contrary human and social values. Latin America: "New Momentum for the Chilean Left"